London, Asharq Al-Awsat—Reports continue to emerge that the White House intends to suspend part of the USD 1.3 billion aid it offers to Egypt annually following a policy review taken after the ouster of Islamist president Mohamed Mursi and a crackdown against the former ruling Muslim Brotherhood by the military-backed interim government. Washington has said that it intends to announce the future of its “assistance relationship” with Egypt in the coming days, however military and economic experts have agreed that any US aid cuts will be “symbolic” and would have little effect on the country. US support would “depend upon Egypt’s progress in pursuing a more democratic path,” he added. Fitch had downgraded Egypt’s long-term foreign and local currency ratings from ‘B’ to ‘B-‘ just days after Mursi’s ouster. Prior to Mursi’s ouster, the White House had requested USD 1.55 billion in assistance for Egypt for 2014: USD 1.3 billion in military aid, USD 250 million in economic aid. The Obama administration has subsequently said it would suspend approximately USD 585 million of the military aid to post-Mursi Egypt pending a wider policy review. “Since we downgraded Egypt [in July] we’ve seen a large inflow of funds from Saudi Arabia, UAE, and Kuwait, amounting to approximately USD 7 billion. That’s played an important role in building up foreign exchange rates and the supporting the exchange rate and the economy,” he added. US aid is seen as a critical pillar of the 1979 Egypt-Israel peace treaty, and US President Barack Obama’s decision to review aid—particularly military aid—to Egypt could have a major impact on Egyptian foreign policy towards Tel Aviv. 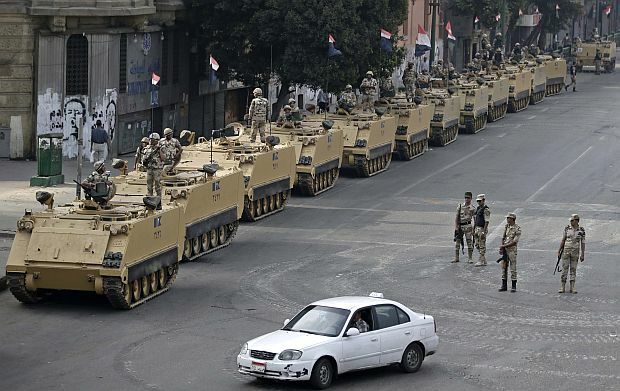 US officials confirmed that aid cuts will hold up the delivery of several types of military hardware to the Egyptian military, including tanks, helicopters, and fighter jets. However this will not affect aid for counterterrorism operations or for border security issues involving the Sinai Peninsula and Gaza Strip. Lockheed Martin, one of the largest US defense contractors, halted the delivery of four F-16 fighter jets to Egypt earlier this year, having previously delivered eight out of a 2009 order of 20 planes.